Posted on May 12, 2015 by Hawaii's Local Buzz. They’re cute, colorful, and have a reputation for being able to talk. Parrots are brilliant creatures, but far too many people fail to recognize just how much work they require as pets. Thus, thousands of parrots are neglected or abandoned by their owners each year. If you’re in love with these birds’ beauty, it’s essential that you carefully think through your decision before adopting one, weighing the responsibilities associated with bird ownership and ensuring you can indeed satisfy them. Parrots are not anything like dogs or cats, and they have human-like life spans (up to 30 years for the smallest parrots like budgies and cockatiels, and up to 50 – 100 years for larger birds). That means they will very likely out-live you if they are well cared for, which means you need to provide for them in your will! 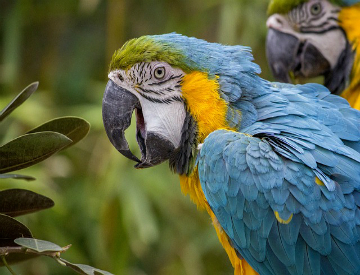 Parrots will scream loud enough to wake the dead at least twice a day, and far more often if they become bored, or stressed, or just plain lonely. Unless you live on a big farm like we do here at Paradise Meadows in Hawaii, your neighbors will very likely not enjoy the noise. Parrots have a need to chew — they’ll be happy to chew on your window sills, moldings and dining room table. To say a pet bird is messy would be the understatement of the century. A pet bird will very likely poop on your floor, your clothes or possessions, and need to have their cage cleaned every couple of days if they live inside your house. They also need lots of (expensive) toys, changed regularly to prevent boredom. And you’ll need to rid their living environment of air fresheners, scented candles, and non-stick cookware, all of which can kill them. To keep them healthy for the duration of their life, you must feed a carefully planned diet of (expensive) pelleted parrot food in combination with plenty of fresh (preferably organic) fruits and vegetables. This means plenty of trips to the market or grocery store and no more last-minute vacations unless you have someone very special to care for your parrot properly in your absence. It’s also very easy for these birds to get stressed, especially if they don’t receive adequate socialization. And if you’re planning to get a parrot specifically for their ability to talk, be aware that many parrots never develop this skill. If you deeply care about birds and are seriously considering adopting one, it’s best to go through a rescue organization, like the Gabriel Foundation, that finds new homes for birds others have abandoned or abused. Five of the parrots at Paradise Meadows Orchard & Bee Farm in Hawaii (home of Hawaii’s Local Buzz) are rescues. We love them dearly, but we always try to dissuade others from adopting parrots unless they are well aware of the challenges involved. You’re always welcome to come visit our beautiful birds! And please, if you have the means, donate to the parrot rescue of your choice. Here at Paradise Meadows we support the Gabriel Foundation, but there are hundreds of worthy organizations caring for the abandoned and abused parrots that have nowhere else to go.